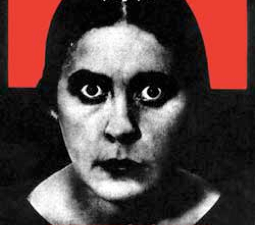 In Elizabeth Bam (1928), a Russian absurdist fantasy on the theme of the dreaded knock on the door, the Soviet police pursue Elizabeth through her cramped rooming house to accuse her of murder. This situation initiates a chaotic series of vaudeville-like sketches of both wish fulfillment and nightmare. The physical aspects of Lukac's highly inventive direction work best--the miniaturized house, a duel of finger pointing, the cast morphing into a train to threaten Elizabeth. But to reveal Kharms as an early Monty Python, the cast needs absolute precision of acting and movement. Since it doesn't, a couple sketches hit but most miss. Photo: Poster for Elizabeth Bam when it was performed at Theatre Glendon in 2002. ©2002 Theatre Glendon.